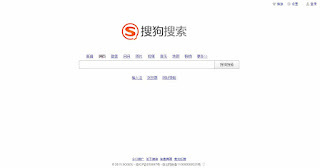 Sogou was founded in August 2004 and was developed by Beijing-based Sohu, Inc., which also owns it. "Sogou" literally means "search dog" [Wikipedia "Sogou"]. It is the number three leading search engine in China (nearly 6% market share in the fourth quarter of 2014), behind Baidu (with about 80% in the fourth quarter of 2014) and Google China (with more than 10% in the fourth quarter of 2014) [Incitez China: 2015]. 2004 - [...] Sohu, Inc.